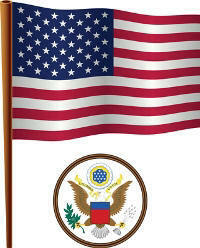 The designation of the National Flag Day is June 14. Every year the President of the United States of America is requested to issue a proclamation that calls for US Government officials to display the flag of the United States of America on all Government buildings on Flag Day. In the proclamation the President also urges the people of the United States to observe Flag Day to commemorate the anniversary of the original adoption of the Stars and Stripes as the official emblem of the United States by the Continental Congress on June 14, 1777. When is Flags Day? 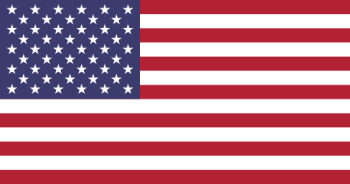 National Flag Day is always designated as June 14, the birthday of the first official US emblem, however the days of the week it is observed changes from year to year. The following table details the days it will fall on each year. The very first observance was made in 1877, full history, facts, dates and trivia are detailed below. The idea became extremely popular especially amongst patriotic societies and veterans groups. State governors and city mayors began to issue proclamations in their jurisdictions to celebrate this event and schools and children became involved with the celebrations. Although it is not a Federal holiday, Americans continue to honor the history and heritage it represents increasing patriotism throughout the country. We have detailed the History, facts and trivia in a history timeline format. The Second Continental Congress authorized a new flag to symbolize the birth of a new Nation, the United States of America. Elizabeth Griscom Ross (Betsy Ross) reported that "she sewed the first American flag"
The Stars and Stripes first flew in a Flag Day celebration in Hartford, Connecticut during the first summer of the Civil War. President Woodrow Wilson issued a proclamation calling for a nationwide observance of the day on June 14. 1949 Congress resolved that “The 14th day of June of each year is hereby designated as Flag Day . . .” The resolution was signed into law by President Harry Truman. 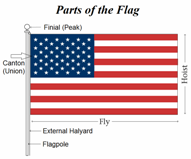 The laws relating to the flag of the United States of America are detailed in the United States Code. Title 36, Chapter 1 of the United States Code relates to patriotic and national observances. 36 USC § 110 - Flag Day. These laws were supplemented by Executive Orders and Presidential Proclamations. Patriotic and national observances - Learn Online!